Every Friday at our local farmers market one of the vendors freshly prepares falafel. The smell of the falafel wafts in the air, enticing visitors of the street market to indulge in their offerings as they shop for flowers, fruits and vegetables. And as much as I love fried falafel, I try to watch my intake of fried foods. I’ve managed to curb overindulging on the beautiful golden-browned nuggets by creating this recipe. You can use dried beans or save yourself some time by using canned, which I often do. If you are using dried beans for this recipe you will need 3 cups once they’ve cooked, which would be just a little over a cup of dried beans. Sauté the onions along with 2 tablespoons of olive oil over medium heat until the onions are translucent, about 5-7 minutes. Then, add the cumin and garlic and continue sautéing for an additional minute to cook out the raw cumin flavor. Place the chickpeas into a bowl of a food processor. Add the onion mixture and the remaining ingredients and process the mixture until you have a thick paste, scrapping down the sides of the bowl as necessary. Carefully remove the blade from the food processor. Start forming 2” mini patties with the dough. Place them on a slightly greased baking sheet about 2” apart from one another. Brush the tops of the falafel with olive oil and bake in the oven for about 20-30 minutes, flipping them over at the halfway point. 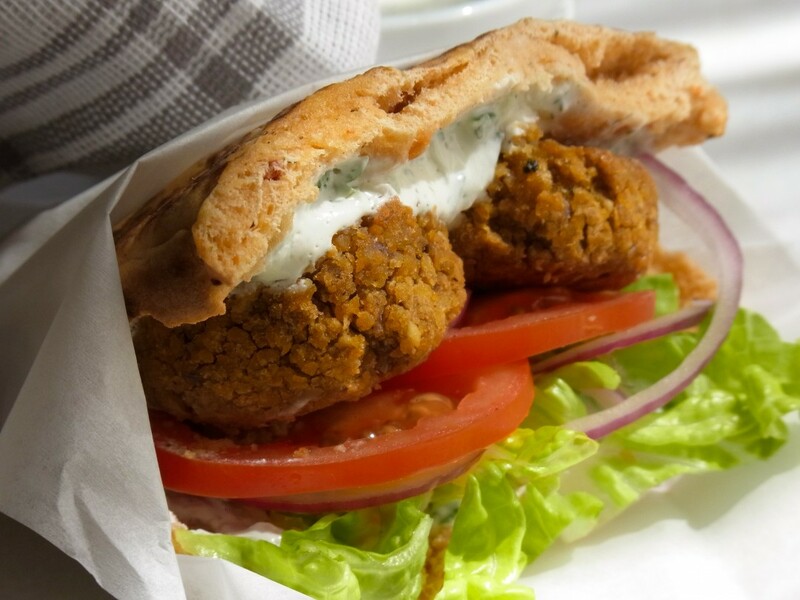 Enjoy warm with pita and lettuce, tomato and tzatziki or tahini sauce.